Explore the numerous day-trip ideas around Savonlinna: New Valamo Monastery (in Heinavesi), Linnansaari National Park (in Rantasalmi) and Punkaharju Ridge (in Punkaharju). Next up on the itinerary: explore the historical opulence of Olavinlinna Castle, contemplate in the serene atmosphere at Kerimaki Church, see the interesting displays at Savonlinna Provincial Museum, and indulge your taste buds at Savonlinna Market Square. 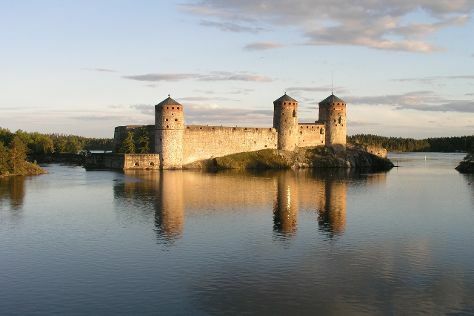 To find maps, photos, traveler tips, and more tourist information, use the Savonlinna tour itinerary site . Toronto, Canada to Savonlinna is an approximately 23.5-hour flight. The time zone difference moving from Eastern Standard Time (EST) to Eastern European Time (EET) is 7 hours. Traveling from Toronto in July, things will get slightly colder in Savonlinna: highs are around 24°C and lows about 13°C. Wrap up your sightseeing on the 16th (Tue) early enough to drive to Mikkeli. Mikkeli is a town and municipality in Finland. Start off your visit on the 17th (Wed): see the interesting displays at Mannerheim`s Saloon Car, examine the collection at Infantry Museum, pause for some serene contemplation at Mikkeli Cathedral, then examine the collection at Headquarters Museum, and finally look for gifts at Mikkeli Market Place. On the 18th (Thu), you'll have a packed day of sightseeing: enjoy breathtaking views from Naisvuori Observation Tower, then pause for some photo ops at Mannerheim Statue, then don't miss a visit to Kenkavero, and finally find something for the whole family at Visulahti. To find more things to do, where to stay, photos, and tourist information, go to the Mikkeli trip site . You can drive from Savonlinna to Mikkeli in 1.5 hours. Other options are to take a bus; or take a train. In July, plan for daily highs up to 25°C, and evening lows to 12°C. You'll set off for home on the 19th (Fri).